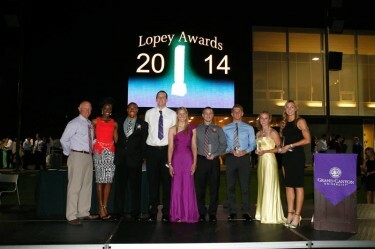 Grand Canyon University athletes have “exceeded everyone’s expectations” in their first year in NCAA Division I, President and CEO Brian Mueller told the crowd Monday night at the Lopey Awards on the Quad. So it seemed only fitting that a group of students from that crowd, which brought together most of GCU’s more than 400 athletes along with coaches and staff, put together a celebration that was upbeat as well. Individuals honored Monday night were (from left) Todd Lehman, assistant track and field coach; Moya McKenzie, track and field; Jevon Estelle, basketball; Killian Larson, basketball; Jenna Pearson, basketball; Kyle Ciliento, soccer; Ivan Nechunaev, swimming; Lauren Graham, track and field; and Phoebe Cipa, golf. The Lopeys, a new way for GCU to honor its athletes from the school year about to be completed, are a takeoff on the ESPYs, cable giant ESPN’s annual Academy Awards-style show. The event had the same type of awards, same type of presentation and same type of semi-formal attire — but with a purple carpet, not a red one. Killian Larson, who led the men’s basketball team in scoring (17.2 average) and rebounds (11.2), got the honor, as expected, over a strong group of candidates. Larson was invited to the National Basketball Association’s pre-draft camp last weekend at Portsmouth, Va., and said he hopes to catch on with an NBA summer league team. If that doesn’t pan out, he intends to explore options in Europe. Larson transferred to GCU from Dominican University in San Rafael, Calif., and is happy he did. The other nominees were Mike Hamel (wrestling), Jerome Garrison (basketball), Michael Pomeroy (baseball), Ben Ponnet (volleyball), Mark Geddes (golf) and Kevin Lashley (track and field). Moya McKenzie, an outstanding 400-meter runner on the track and field team, wasn’t a surprise choice, either – except to her. Other nominees: Charlotte Jaengkit (golf), Kaitlyn Petersen (basketball), Priscilla Annoual (tennis), Hannah Kastigar (swimming). The male winner was Ivan Nechunaev, a swimmer from Tomsk, Russia. The female winner was Lauren Graham, a pole vaulter on the track and field team. Basketball player Jenna Pearson was a popular pick, especially with her coach, Trent May. Other nominees: Emily Ravenhill (women’s soccer), Blake Davis (men’s basketball), Claire Zampini (softball). This is a classic ESPY category, and the award went to golfer Phoeba Cipa for her hole-in-one at the GCU Invitational in February at Wigwam Golf Resort in Litchfield Park. Cipa’s ace came on the 126-yard 11th hole. Other nominees: Gerrit Thomes for his second-overtime goal vs. Incarnate Word; the 400-meter women’s medley relay for its victory in the Western Athletic Conference Swimming Championships (its time of 3:40.91 was nearly seven seconds better than the school record); and Chelsea Santos of the women’s soccer team for her free kick vs. Idaho. Kyle Ciliento, who returned to the field for the first time since 2010 and became GCU’s career-goals leader with 56, was the choice from men’s soccer over Stacey Wymer (women’s swimming), Karlin Stewart (men’s track and field) and Daniel Alexander (men’s basketball). The baseball team’s 3-1 victory at the University of Arizona was chosen over the men’s basketball victory over California State University Bakersfield at GCU Arena, in which it overcame a 20-point deficit; the women’s swimming team’s dual-meet rout of New Mexico State; and the men’s volleyball team’s comeback victory over University of the Pacific. Jevon Estelle, who went from the Monsoon student cheering section to a spot on the basketball roster, was the pick over Felipe Reyes (men’s soccer), Nikki Stanley (women’s soccer) and Jahliell Wiltshire (men’s track and field). Assistant Coach Todd Lehman of track and field, whose three pole vaulters went 1-2-3 in the WAC Indoor Championships, was chosen over head coaches Greg Prudhomme (tennis) and Steve Schaffer (swimming) and Associate Head Coach Cory Cole of women’s basketball. Women’s track and field, which won the WAC Indoor Championships, was the choice over women’s basketball, men’s track and field and wrestling.